The interleague round-robin for B-level banked track teams comes as a welcome tuneup before this summer's Battle on the Bank. This Saturday, March 5, the San Diego Derby Dolls and the Roller Derby Coalition of Leagues will present Spring Fling, a one-day tournament and exhibition for banked track leagues from around the country. No, really. The four participating teams are really and truly from around the country, marking the first time outside of Battle on the Bank that an RDCL event will have such diverse geographical representation. San Diego will be fielding their Sparks B-team. 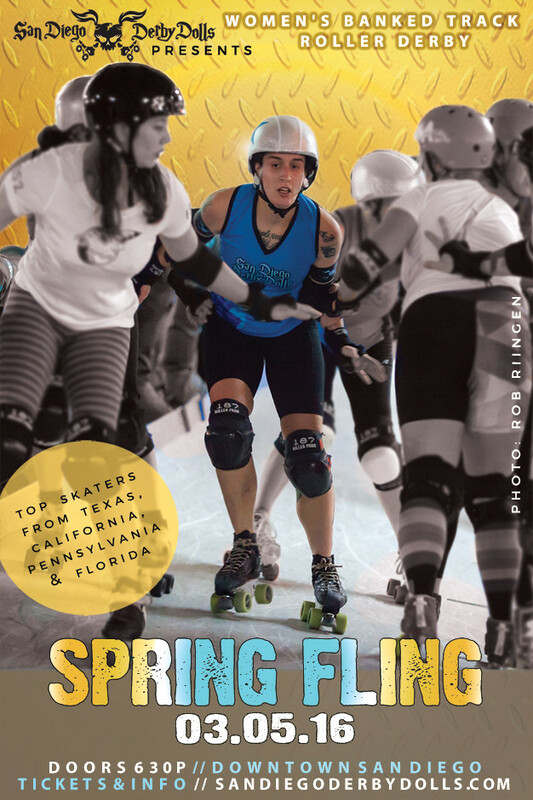 Joining them will be South Side Roller Derby of Houston, Texas; Penn-Jersey Roller Derby of Philadelphia, Penn. ; and newcomers Deadly Rival Roller Derby from St. Petersburg, Fla. The entry of Deadly Rival is a mighty interesting story. In less than a year, they acquired a track, built it up, started skating on it, and are all of a sudden sending a team across the country to enter into what will seemingly be a trial by fire against leagues with a good deal of banked track experience. Talk about going for it! South Side is fortunate to play in an area of the country that’s heavily saturated with banked tracks, so the need for them to travel for competition is lessened. (Especially now that one of their suburban neighbors is going banked.) Still, as a multi-time Battle on the Bank participant, they know the importance of getting in play time against teams from outside the area. So does Penn-Jersey, which will be making a return to San Diego after a strong but winless showing at Derby Daze last May. The She Devils were also winless at Battle on the Bank VIII in Seattle last June, which was a bit of a surprise. They’ll want be make sure they are on top form, since they’ll be hosting BotB IX in Philly in a few months, the first time the RDCL will be playing off on the east coast. As for the hosts, San Diego has been showing signs of a return to form after a few years of Battle on the Bank also-ran finishes. Their all-star team, the Wildfires, came up a jam or two short against the Arizona Derby Dames last week, which bodes well for San Diego against the cream of the RDCL. Though SD is sending in the B-team for Spring Fling, it’s still the favorite coming in. All four teams will engage in 30-minute round robin games in the morning and early afternoon. Rather than having final bracket, San Diego decided to have a bit of fun for the evening program. They’ll take the best players from all four of the representative teams and mix them up for a full-length game to finish off the event. The mixer bout will be the only one open to the public, however. If you’re in the San Diego area and want to check out some of banked track derby’s up-and-comers, ticket and schedule information is available on the SDDD website, here. Roller Derby Notes will be at the Doll House for most of the day on Saturday. For updates, video clips, and other fun stuff from Spring Fling, follow us on Twitter and Instagram @derbynotes.